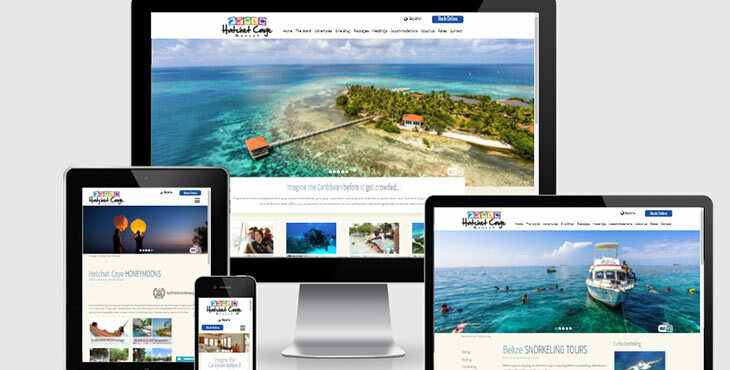 Belize Internet Marketing & Website Design is proud to announce the launch of the new website for Hatchet Caye located off the coast of Placencia, Belize. The new site features clean, big and bright pictures and a great layout that is user friendly and really fun to look at. The site is also mobile responsive and will adapt easily to any hand held device for easy browsing. Hatchet Caye Private Island Resort is a beautiful, growing resort full of adventure and amazing views. Because it’s an island guests have access to great marine experiences and tours. The recent renovations to the rooms on the island can accommodate more people and make your private island vacation a dream come true. Check out the picture below for a sneak peak of the home page.